Sellacious crops up the idea of using social proof to increase your business sales with its feature of review and ratings. Using reviews and ratings on the products, packaging and much more by your existent buyers can attract faith and value of your customers. 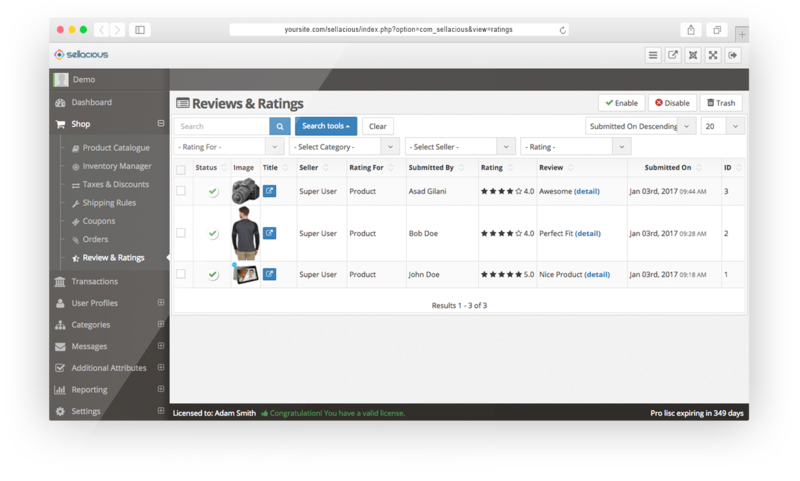 Give your buyers the freedom to rate the products they buy giving a clear insight to other buyers winning over genuine customer base and goodwill for your store. Lets you be aware of the response behaviour of your customers. Buyers are as likely to reviews as ratings. Conscious of the fact, sellacious has the feature to let you allow your users leave valuable reviews on products or sellers. On the graph of which you can manage and operate the behaviour of your store, letting you enjoy better sales. Not only the reviews and ratings, Badges are one of the proven method to gain faith of buyers, With sellacious you can use the same to its best by showing featured badges on specific reviews like certified buyer, first to review or customised according to the need. Sellacious makes no inconvenience and non-duplicity a surety, Allowing you to control your review and rating sections, letting the feature be customisable, You can let only certified buyers to review or stop guests to review anything on the store.